My hunt for a Wednesday weekly was aided today by Joy, who introduced me to A-Z Wednesday hosted by Vicki at Reading at the Beach. Simply select a book from your library whose title begins with this week’s letter and post a photo, title and synopsis, and a link, then swing by Vicki’s blog and drop a line directing everyone to your entry. Don’t forget to share it here, as well! This week’s letter is “W,” and I went with The Westing Game (I didn’t see rules about articles counting or not counting for title beginnings, so I made up my own *wink*) by Ellen Raskin. I first read this in elementary school, and didn’t realize it had been around for so long. I re-read it a couple of years ago, so forgive if my synopsis is vague or even imperfect in its details! The basic story is that a group of seemingly unconnected individuals and families all move into a new housing complex and are informed that they are beneficiaries of the recently-deceased multi-millionaire, Sam Westing. 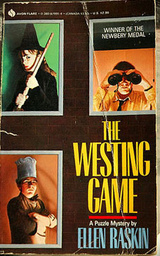 Westing has devised a competition for his fortune and set it forth in his will; the sixteen invited individuals are paired off and pitted against the other teams in a challenge for the inheritance. Raskin’s characters are brilliantly realistic, and her plot twists not reduced for an elementary reading level. Definitely recommended to anyone who enjoys a cleverly written puzzle novel. Have you read this one? What did you think? Do you have a good “W” book on your shelves? Tell me all about it! Haven’t read this one, but it’s going on my “must read” list right now. Sounds like a lot of fun. Great choice for “W”! .-= JLS Hall (Joy’s Blog)´s last blog ..A-Z Wednesday: "W" =-. Thanks, Joy! I’ve been meaning to read Wuthering Heights for years; it was on the syllabus for a women’s lit course I took in the fall of 2008, but got bumped because we had so much else to cover. One of these days, I swear I’ll get to it…! I haven’t read the book but saw the movie years ago and it was very good! 99.9% of the time, the book is a lot better. .-= Vicki´s last blog ..Book Tour & Review: Buying Time =-. Hi, Vicki! I’ve found that to be the case also, and so often I wish I’d see a movie before knowing it was a book so I’m never disappointed, as I almost always am when I read the book first.